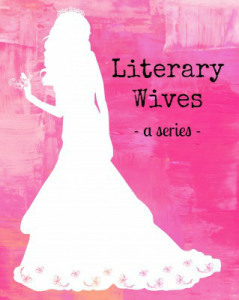 Don’t forget to check out the other members of Literary Wives to see what they have to say about the book! And welcome to our newest member, Kate! When my husband saw me reading this book, he told me he was glad I was finally reading something useful. I didn’t even get his joke at first, because never would it cross my mind that someone would write (or read) a non-fiction book called ‘How To Be A Good Wife‘. Ugh. But there is such a book featured in HTBAGW by Emma Chapman. 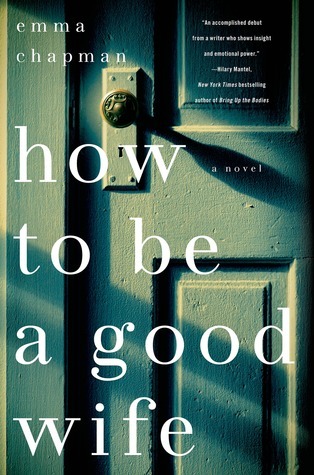 Goodreads synopsis: Marta and Hector have been married for a long time. Through the good and bad; through raising a son and sending him off to life after university. So long, in fact, that Marta finds it difficult to remember her life before Hector. He has always taken care of her, and she has always done everything she can to be a good wife—as advised by a dog-eared manual given to her by Hector’s aloof mother on their wedding day. 1) Aargh! I can’t stand not to know what happens. Am I missing an important piece of information? Or are we left not knowing what really happens?! What are these special pills that will erase someone’s memories of the past? Do they exist? Did the doctor even ask for them, so he could figure out what she might have been taking them for? Why was she in such a hurry to kill herself? She was safe from her husband. And, if her story was true, wouldn’t she want to continue on her path to proving it? If she was in her right mind, why would she think it was a good idea to kill herself on her son’s wedding day?! I think it’s safe to say that she’s ruined the Honeymoon. Not to mention that poor Laura (her ‘companion’ at the institution) will likely be fired from her job. 4) But… if Marta really is ill, why do we never get to find out about her life before Hector? How did she come to show up on his doorstep, so sick that she doesn’t remember anything about her past? 6) Because… to make things even more confusing for us, Hector does seem to be a good father. In the scenes that we’re shown in the book, he is by far the more reasonable of the two parents. Marta’s behaviour appears to be selfish and desperate (because she is desperate not to be left alone with her husband for the rest of her days), and had me cringing as I read. Even though I enjoyed reading this book, it definitely left me with more questions than answers. Hector is too protective and controlling of Marta. Among other things, he told her never to go beyond the town limits, for her own protection. He tries to ease his controlling ways with the argument that it’s all for her own good, because he loves her so much. In addition to this, she suspects him of having an affair with at least one of his students, and he has now been suspended from work for the possibility of this very thing. However, after years of doing and believing everything he says, and living in her small world, Marta doubts herself and doesn’t know what to do. She feels trapped and alone in a controlling and abusive marriage (and, in her case, with all the bombarding memories from her past, a confusing one). It’s easy to look at a photograph, and to tell yourself things happened in a certain way, that you were happy. Easy to talk about it until it seems that it really happened that way. I think of Hector and me in the house, indefinitely, trying to find things to fill the time, and I feel like a hand is closing around my throat. I’m curious to know what others thought of this book, and whether anyone can clear anything up for me (or maybe we are meant to be confused from beginning to end). But we’ve gone camping again, so I’ll have to be patient. I’ll join in the discussion and respond to your comments when I get back! **On the first Monday in October we’ll be talking about American Housewife: Stories by Helen Ellis. Read along, if you like, and join in the discussion! I can’t shed any light on the book but I did enjoy your review, Naomi. I hope you’re not still scratching your head about it under canvas! I think we’re supposed to be in some doubt, but I incline to Marta’s having remembered her actual life. I don’t think the magic pills made her forget but just sort of spaced her out. I know from talking to some people who have had to take certain types of medication, especially for certain types of mental illness, that it can just sort of blank you out. A heavy anti-psychotic, whether she needed one or not, would do that. I think Hector’s behavior shows that he is controlling and abusive and that she isn’t hallucinating. I’m glad to hear I wasn’t the only confused one who didn’t know what really happened. I was completely believing Marta’s side of things until I thought about all the weird things about it, like the fact that it seemed like no one was looking into her version of things. And, I felt like if she was in her right mind, she wouldn’t have been so quick to commit suicide Since then, of course, I have read Kate’s take on the ending, which I like much better! I just had the thought–how seriously are we to take her son’an allegation that they could find no record of someone like her disappearing. After all, if he thought she was delusional, he may not have looked. Yes, he probably wouldn’t want to know. I wondered the same thing… And he may not *want* to find anything. So interesting… I also noticed the “there now” comment, but again let it pass by. Hmm. I’m more conflicted about what happened after reading all of your reviews! Yes, I took that “there now” comment as proof that Marta wasn’t hallucinating. Hector’s behaviour with his son threw me, as well! But, I agree that he was a creep no matter what. No wonder Marta didn’t want to be left with him for the rest of her years. When I got to the end of the book, I also had to wonder how realistic it is that their son turned out so well. I’m glad he did, though. Ok… now I’m started to doubt Marta more. What were those pills?! Why did she think killing herself is a good idea?! But IF her story is true and Hector really did kidnap her, I can’t think of a worse situation than having your story utterly ignored and being institutionalized. That’s a good point about poor Laura—I feel really bad for her! And, yes, I was horrified for her when everyone was just pushing her into the institution without even giving her any indication that they might be looking into their story. How hard would it have been for them to reassure her and keep her up to speed about what was going on? Not cool. I totally can’t read your review because you said there are lots of spoilers and I marked this book “to-read” a while ago. Someone else reviewed it…. but I can’t remember who! I usually mark in the private notes on Goodreads who wrote the review so I remember to tag them, should I read and review the book. I usually try to avoid spoilers, but in this case, I just couldn’t do it! You can come back after reading the book! One a fun note, I started following three of the book club folks you mention in this post! I love the logical sequence you take with all of your questions and the points that counter other points. Well done. This was a confusing book as well, and I am as unsure as you are of her saneness and/or mental illness. While I was reading your thoughts about their strange marriage, strange even if the whole kidnapping part isn’t true, it reminded me of Hector’s being fired from work. I don’t think any of us mention it (although I still have two others’ posts to read) and I think that his possible philandering could be a clue as to his ability to kidnap a young girl and make her his wife. However, if he were this creepy, wouldn’t he have killed her before 25 years went by and tried it again with another person? It seems like that would be a pattern, based on all my TV watching. 😉 I’m confused too! I was happy to come back to find that I was not the only confused one! It sounds as though we are supposed to be in doubt of everything. I definitely think the hints about his philandering are another clue to his creepiness. Even if he wasn’t a kidnapper, he was creepy! I wonder if his age had anything to do with the fact that he didn’t make it a pattern. Also, he could have ‘loved’ her in an unhealthy, obsessed kind of way. As long as she stayed on her pills, he was guaranteed a partner to live with and take care of him. Thanks for warning me off it! I can’t stand plot holes or loose ends. Your point-by-point reflects my thoughts well! Then add arrows, because I felt like I was going in circles between the options all the time. Though I love ambiguity in books, especially in endings. Complex uncertainty challenges us in ways that I think more accurately reflect real life. I also had more resolution around Hector’s kind behavior toward his son. If his goal was to have the Stepford house situation, then he needs to fit his role in that as well. His goal wasn’t to overtly abuse — it was much more subtle than that. It hope was to fulfill some “Leave it to Beaver” fantasy ideal. And a happy son is as much a part of that as a robotic wife and the upright husband. Oh, that makes sense! Thank you! Hope the camping was great! Great review. I stopped reading midway because of the spoilers coming up. Then I read the end. But I can see that you spent quite a lot of time thinking about it. I will look forward to American housewife. I tried to read your listed thoughts on the book but it was so hard to understand them because I have little context, haha! Agh, was not a fan of your husbands joke either! The book’s title is risky because it initially sounds off-putting, but I suppose it can catch a reader’s interest into learning more about it. That’s an extra step that’s required, though, so it may potentially lose some readers. The name itself makes a lot of sense after you read the blurb. Another book name that is initially off-putting is The Book of Negroes. If you have no knowledge about what it’s referring too, I do admit that it’s quite a bold title! Perhaps that’s why it was called Someone Knows My Name in other countries. The tittle didn’t stop it from being wildly popular, though. So perhaps controversial book names are a good idea! I think that was exactly the reason The Book of Negroes had a different title in the US. I think the original title makes sense, though, considering the content of the book. Sorry about the review style – I sometimes write my LW posts directed at the other Literary Wives knowing that they’ve also just read the book. Which probably isn’t as great for everyone else. I knew that the review was targeted at your reading group, which is fine. It allows you to have more fun with it and get to the meaty specifics of the story! Oh my gosh, I read this book last year so I can’t help you with specifics, but I absolutely loved it. And…I thought Marta’s story was true and that she killed herself because she was not believed. I also seem to remember thinking that there are drugs for schizophrenia or other mental disorders that mess with your memory so I believed that Hector had gotten them prescribed for her. Having said all that, I did love that book was so ambiguous and could see a different view of it. It would be a great book club book because of people’s reactions! Now I’m thinking I might suggest it for my Real Life book club sometime. I wonder how many different versions of the story we could think up?